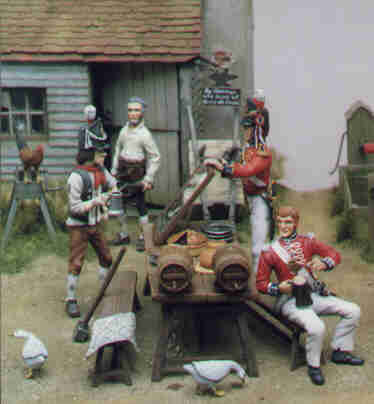 Of the various types of military modelling, figure painting can be the most challenging. The different materials and textures of flesh, clothing leather and metal need to be accurately represented to achieve a realistic result. The areas of the figure in light and shadows and the folds in the clothing should be shaded and highlighted to avoid a flat, featureless, effect. In my, admittedly limited, experience I have found that the best type of paints to use are artists oil colours. To those who haven't tried it before, the mere thought of painting in oils may be daunting, but with practice and patience the end result will be well worth the effort. An essential requirement for successful painting is a selection of high quality brushes. Only the best will do, I'm afraid, and although artists sable pencils are expensive, the quality of finish will be far superior to that produced by a cheap brush. An acceptable substitute are those brushes with man-made fibre bristles; although they have the disadvantage that they do not hold paint very well and the points tend to bend double permanently after painting into recesses, they are comparatively inexpensive. Like everything else in this life, you get what you pays for. Three or four good brushes will be sufficient. The sizes that I use most frequently are: No. 2 for large areas and priming, No. 1 for blocking in base colours, Nos. 0 and 00 for fine detail and blending. Unless you intend to paint flats, No. 000 any anything smaller are not worth buying as they hold little paint. Take your time when choosing brushes; choose those with long bristles and moisten them between your lips to ensure that they come together in a needle point. You will probably attract strange glances from the shop assistants as you do so, but do not be deterred; just smile winsomely to cover your embarrassment. Keep in mind that these are expensive items so don't be tempted to buy the first one you pick up. At the end of each painting session, thoroughly wash your brushes in turps and gently squeeze out the excess onto a cloth or paper towel. A little soap worked into the bristles with finger and thumb will help to keep them supple and preserve the point. Now for the paints. Rowney and Winsor & Newton produce small "students" tubes of oil paints in a wide range of colours. The pigments are not so finely ground as in the large "professional" tubes, but these are considerably less expensive and should last a long time, as the amount used for each figure will be small. A basic range of colours could be as follows: - titanium white, lamp black, yellow ochre, cadmium lemon, burnt umber, alizarin crimson, scarlet lake, cobalt blue, French ultramarine and Prussian blue. Also useful are a couple of greens, chrome green and oxide of chromium. Theoretically, there are only five essential colours; red, yellow, blue, black and white, and all the other shades can be mixed from these. In practice, this is a tedious, hit and miss business, not worth the time and frustration. My own preference is for Winsor and Newton paints as these are not so oily as others, allowing better control of consistency. Oil paint that is brushed on too thickly will obscure the detail on the figure, and will leave brush marks and unsightly ridges, so it is necessary to use a thinning agent. Turpentine (not white spirit) is the most common and should. be added until the paint is of the consistency of thin cream. Use either a purpose made palette, an old saucer, or even a ceramic tile when mixing and thinning. Turpentine will also speed up the drying time, which can be further accelerated by placing the figure in a warm place - an airing cupboard is ideal. Always cover the figure while it is drying, as wet oil paint attracts dust like a magnet attracts iron filings. Oil paint can be kept fresh for several days by covering your palette with cling film or kitchen foil and placing it in the refrigerator. Remember that turpentine evaporates rapidly, so from time to time check the consistency of the paints and add turps as necessary. I have found that various colours dry to different finishes. For instance, white will dry matt, but burnt umber dries with a high gloss. To gain uniformity of finish the addition of a matting agent, such as Parris's Marble Medium or Winsor and Newton's Opal Medium, mixed into the paint will cause it to dry to a slight sheen. Alternatively, one or two thin coats of Humbrol or W & N matt varnish, applied when the paint is absolutely dry, will serve equally well. Good lighting is necessary as well. Ideally, painting should be carried out by daylight, but as most of us have to work during the day this is obviously impractical. I have found that a desk lamp such as an Anglepoise, adjustable to any position and fitted with a 10w bulb is adequate. That seems to be the basics covered reasonably well, but obviously each painter will adopt certain factors to suit his own circumstances and resources. In part 2 we shall discuss methods and techniques. There are no hard and fast rules as regards figure painting. Each painter has his/her own methods, techniques and rituals developed by trial and error and much burning of midnight oil. Therefore the following is one particular method only and should be regarded as a guide and not as gospel. Ideas and tips can be gleaned from books and magazines, but the best sources of information are modellers themselves, whether at your own club or at exhibitions. Most are friendly and flattered by genuine enquiries and will usually be only too pleased to help and advise. Before any paint is applied, the completed model must be thoroughly cleaned to remove grease from your fingers or from the moulding process. Immerse it in warm water to which a little washing up liquid has been added, and gently swirl it around for a few minutes. Rinse thoroughly in clean water and allow to dry completely. The next step is to attach the figure to a temporary base or handle to prevent your fingers touching it during paint ing. This can be a cotton reel a suitable length of dowel or broom handle or a purpose made tool such as an "Andy Clamp'. Go easy with the glue though; remember the figure has to be detached intact when finished! Do not allow your fingers to touch the clean figure, wrap it in a lint free cloth or cover your hand with a plastic bag. The first painting task is to prime the figure to provide a key for the oil paint. I have found that the most suitable primer is Humbrol Matt enamel My own preferred method of priming is to paint all flesh areas and white portions of uniform with white, and the rest of the uniform with the nearest approximate colour to the finished shade. The paint is diluted with turps to about 50/ 50 ratio, several thin coats being less likely to obscure fine detail than one thick coat. On plastic figures one coat is usually adequate, but with metal figures sufficient coats must be applied to prevent the colour of the metal showing through, as this will give a dirty grey tinge and ruin the effect. The reasons for colour priming, as opposed to all white, are twofold Many oil colours, especially the lighter shades such as red and yellow, are translucent and will allow a white primer to show through, giving a patchy effect. The other reason is time. If the figure is primed carefully with the appropriate colours, continual checking of references can be avoided when applying the finish coats. Prime gold lace and brass with yellow, steel and white metal with mid-grey. As enamel cures quickly a coat of each colour can be applied in one session, but subsequent coats must not be applied until the paint has been allowed to dry thoroughly, say overnight. Once the figure is primed to your satisfaction, a decision must be made from which direction the light is to fall as this will dictate the areas to be shaded. Two extreme examples will illustrate this point, if a figure is to be depicted out of doors at noon, the light will come from directly above, making the upper surfaces, like the top of the head and shoulders, the lightest, and the armpits and crotch the darkest, with a fairly gently graduation of shading. Now imagine a night scene with a figure depicted in a dark street facing a brightly-lit doorway. Obviously the whole of the front will be very light, the back will be very dark with a sharp definition between light and shade. For the purposes of this article we will assume that the figure is in 'high noon' light. Now the dreaded moment has arrived; the figure is primed and ready, serried ranks of paint tubes are waiting to be squeezed. brushes impatient to be flourished. You can't put if off any longer, so take a deep breath and start. The most difficult part of any figure to paint is the face. The face determines the character and is the first part of the model that anybody looks at. No matter how well the uniform is painted, if the face is not credible the rest will not be noticed. One advantage of painting the face first is that if you are not satisfied with the result the whole lot can be wiped off without risk of harming anything else. Start with the eyes. Having determined their colour, mix the paint with a little thinners and use your smallest brush to place a spot in each eyeball. The paint will not leave the brush easily if it is too thick and you will find yourself pressing harder until an unsightly blob appears. If the figure is looking straight ahead, the pupils should be directly in line with the corners of the mouth with a little white showing at each side. To avoid the 'staring' effect try to shape them as shown in fig 1. Next, apply a little burnt umber in a fine line to the upper and lower lids to define the shape of the eyeball. If these lines are too thick don't worry. Rinse the brush in turps and with it damp you can 'cut back' the paint until the finest line possible is achieved. Once the eyeballs are painted to your satisfaction, you can relax and have a fag or a cup of tea to celebrate, because the worst is over! Squeeze a small amount of the following colours onto your palette; white, yellow ochre, scarlet. crimson, burnt umber and Prussian blue. Mix the yellow ochre into the white a little at a time until a creamy buff colour is obtained. Add a small amount of scarlet for a pink tint and an equally small amount of burnt umber for a tanned effect.. This is very much a trial and error exercise; dab a touch of paint on the back of your hand and rub it in. Add whichever colour is necessary until it blends with your skin. Make sure that the paint is well thinned - the consistency of cream is just about right. Separate part of the basic flesh mix and add a tiny amount of Prussian blue. This will be your shading colour. Apply thinly to the following areas (see fig 2); hairline, eye sockets, bridge and sides of nose, under end of nose and nostrils, under bottom lip, under jaw and behind ears. If headgear with a peak is worn the shadow on the upper part of the face will be darker with no highlights but do not over emphasise this as the peak will cast its own natural shadow. A handy tip is to use a mirror to see on your own face exactly where shadows are cast. If you want the face to have an unshaven appearance, add a little Prussian blue to some of the basic flesh mix and paint this over the beard area. Use this only on dark-haired types, a blond Viking looks silly with "five o'clock shadow"! Separate two more parts of the basic flesh mix and add a little scarlet to one and a little crimson to the other. With the scarlet mix paint the lower lip, ears and add a touch to the cheekbones. Paint the upper lip with the crimson mix. Now paint the rest of the face with the basic flesh mix, taking care to apply the paint right to the edges of the shading colour. Your end result should be a face with well defined but not too sharply contrasted areas of colour. Hold the figure at arms length and half close your eyes, if the contrast is still noticeable it is too great and you run the risk of producing a "chalk and cheese" effect. The next task is to merge these areas of light and shade by blending their edges until a smooth, gradual change of shade is achieved with no discernible dividing line. This is accomplished fairly easily by one or other of the following methods. With the point of a fine dry brush, gently stipple or dab the paint back and forth across the border line until the shades merge. My own preferred method is to "zigzag" gently with the point of the brush in constant contact with the surface (fig. 3). Blending is a painstaking process that needs a fair amount of practice to perfect, but the end result is well worth the effort. If the brush tip picks up too much paint in the process, gently wipe it off onto a paper towel, but take care to preserve the point. It must be stressed that the brush must be absolutely dry or the paint will be diluted, allowing a line of undercoat to show through. As with shading the dark areas of the face, we now need to highlight those parts which catch the light. Apply a little white to the following: forehead, ridge of the nose and nostrils, chin (if clean shaven), tops of the cheekbones, lower lip, bags under eyes. Lobes and edges of ears (see fig. 2). Moderation is the keynote of this exercise, too little being preferable to too much. Blend as before, making sure that your brush is clean and dry. If your confidence and hands are steady enough try placing a tiny dot of white in the same position in each eye as a highlight (fig. 1). This is not absolutely necessary. but it will bring the eyes to life to a great degree. Having now successfully painted the perfect face, cover the figure to keep out dust and wander off for a pint. You deserve a break and when you return refreshed you will probably notice one or two small errors, bare patches or unblended areas previously overlook ed. Having been away for a while will also have restored your critical judgement which tends to submerge when concentrating for a long time on the object a few inches in front of your eyes. At this point you must be prepared to be absolutely ruthless. If you are not happy with the result and need to make anything more than minor adjustments, don't. In my experience, attempts at major alterations are a fruitless and frustrating exercise which only make matters worse. If you can leave it, the knowledge that it is less than perfect will linger, and the more you look at it the more you will wonder "Could I have done better a second time?" So, if you really are not happy, wipe it off and start again. But you won't have that trouble as your figure's face will be perfect first time, won't it? Although the face is not quite finished yet, the next step is best taken when the paint is dry, so cover the figure and leave to dry in a warm place, like an airing cupboard, overnight. If you have finished painting, cover your palette with cling-film or foil and place in the fridge to keep it fresh. Don't forget to add more thinners to the paint when you come to use it again. The finishing touch is to line in with burnt umber the sharp folds and creases on eyelids, ears, nostrils, between lips and the nostril apertures. Ears need special care as their shape is complex (see figs. 1 & 2). The same principles for painting the face apply to the hands but folds and creases should be sharper and more defined. Highlights should appear on knuckles and tendons on the back of the hands. 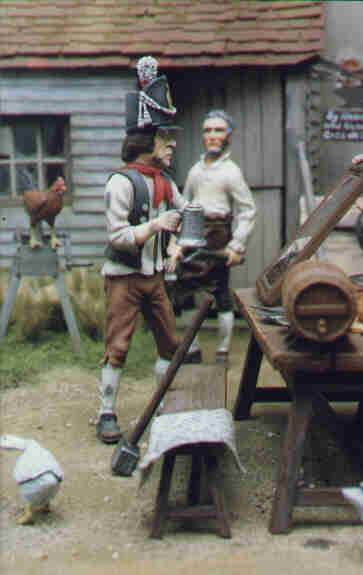 It is essential to shade and line in between the fingers to indicate that they are separate and do not appear to be welded together as is seen on so many figures at exhibitions. Paint fingernails with the scarlet paint mix and line in around them. When the paint is absolutely dry, I usually give all the flesh areas one or two coats of thinned matt varnish. This serves a dual purpose Firstly, it gives an overall matt finish which the oil paint alone may not achieve. Second, and I think most important, it protects the paint from being rubbed off by handling and from inadvertent smears of uniform or hair colour. If this does happen, the unwanted paint can be removed by wiping off with a clean brush dipped in turps. You will find that if you mark the flesh after your initial mix has become unusable, it is virtually impossible to mix another batch to exactly the same colour. The hair should now be painted and this is only a matter of an overall base coat of the desired colour with two or three "dry- brushed" applications of successively lighter shades using less paint each time. This will add depth to the hair areas. Do not simply paint the hair line as a sharp edge; before blocking in the larger areas, paint around the hairline with small strokes of a fine brush, following the direction of the hair growth. (see fig. 4). And that's all there is to it! Although it sounds a formidable task, in practice it is not really difficult, believe me. You will find, as I did, that each figure will be easier to paint than the last and the techniques will become second nature However, the keywords for the beginner are Observation, Practice, Experiment and Patience. Look at the people around you and make notes, mentally or on paper, of the various combinations of complexion and colouring that you see. Practice painting faces to develop your own personal style A good idea is to use several heads from the Multipose or Phoenix and Historex spares. Experiment with different amounts and combinations of colours, and methods of shading and highlighting. You may find short cuts and improvements to make the job easier and more realistic. Make notes of successful mixes so that you can easily reproduce them. But above all, patience. If at first your results are disappointing, persevere. Don't be tempted to give up, telling yourself that it is too difficult, because it isn't. Lets face it, if I can do it anybody can!